The freshman Graphic Design and Communications students at BSC put the college on the map with one of their final assignments. The assignment consisted of a few pieces – it started by randomly drawing numbers that represented each of the BSC campus buildings. Students chose two numbers and were then expected to shoot photos of the buildings. The photo parameters were simple – capture an image that represents the building, it could be inside or out and didn’t have to encompass the entire structure. The idea was to shoot photos like those that would be used in advertising pieces. After students edited their photos, each uploaded the photos to a service called Panoramio that hosts images for Google Earth. The assignment was completed in early May and the photos are just beginning to show up. Each photo is reviewed by Panoramio staff before it can be viewed on the map. Check out students’ work by opening Google Earth (the application can be downloaded here for free) and locating Bismarck State College. Make sure the Panoramio Photos layer is turned on. Click on the small blue squares to see images of the college. There are a few images of buildings that didn’t exist such as the National Energy Center of Excellence building when the satellite maps were created. There should be several more photos appearing throughout the summer. 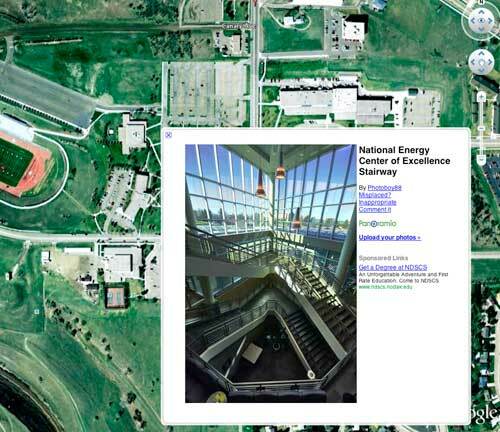 A screenshot from the Google Earth map of Bismarck State College shot by the Graphic Design and Communications students.